All push button operation, one touch only for automatic calibration, depress another to increase or decrease the calibration values. Automatic Temperature Compensation assures that readings are corrected for temperature offsets. 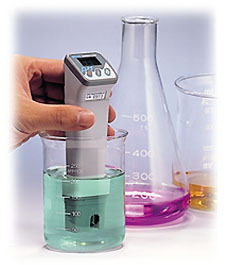 Calibration up to 3 (pH 4.00,7.00,10.00) points. Durable / precision pH pen complies with IP67 waterproof standard. Portable design with pocket clip. Probe easy to replace and assemble. No tools or trimmers needed for calibration. Meter includes battery and manual in a gift box. Auto power off : 20 minutes. Input impedance : 10 ohms. Dimension (H xWxT) : 149 x 37 x 42mm.